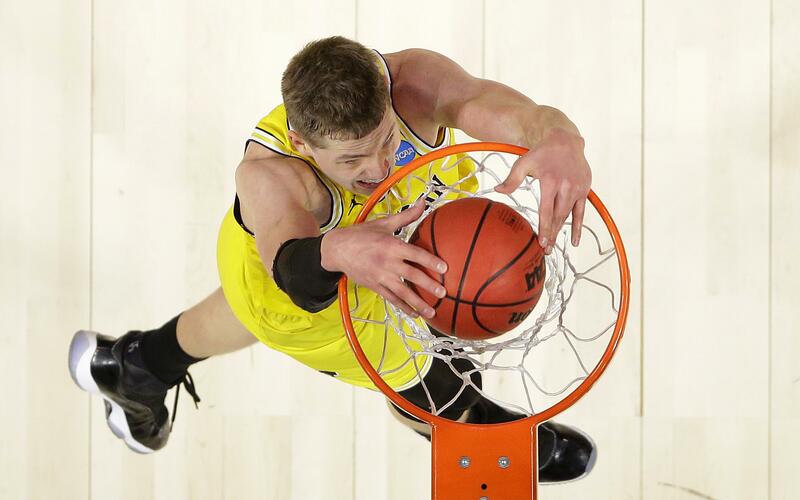 UPDATED: Thu., March 22, 2018, 9:35 p.m.
LOS ANGELES – Michigan’s Muhammad-Ali Abdur-Rahkman said the Wolverines were able to pick and choose their spots on offense during a Sweet 16 game against Texas A&M. It looked like there wasn’t a bad one Thursday night on the floor or the Staples Center. The Wolverines have been building momentum for two months now, ever since their last loss on Feb. 6 against Northwestern. And it doesn’t look like the late-season crescendo will end anytime soon following a dominant 99-72 victory over the Aggies that moves Michigan to its first Elite Eight since 2014. The Wolverines will play Florida State on Saturday with a spot in the Final Four on the line. Michigan scored the game’s first basket and never conceded the lead, shooting 62 percent from the field and just under 68 percent in the second half. The Wolverines were blazing hot from the 3-point line, canning 14 of 24 attempts and 10 of 16 in the first half. If anybody is able to knock down the Wolverines in this tournament, they’ll have to end a long winning streak to do it. Michigan’s reeled off 12 straight wins since the Northwestern game and ripped through the Big Ten Tournament, winning four times in four days. The Big Ten Tournament run included wins over No. 2 Michigan State and No. 8 Purdue to capture coach John Beilein’s second conference title. The Wolverines took a 33-12 lead in the first half against Texas A&M and eventually extended it to 29 points with 1:06 to play before the halftime break. The Aggies cut the deficit to 18 points midway through the first half, but Abdur-Rahkman hit a 3-pointer and Michigan never trailed by fewer than 20 the rest of the way. He led the Wolverines with 24 points, hitting 4 of 7 from beyond the arc. Wagner scored 21, knocking down all three of his 3-point attempts. As a team, Michigan also dished out 21 assists. Tyler Davis scored a game-high 24 points for the Aggies, making 11 of 17 from the field. Published: March 22, 2018, 8:10 p.m. Updated: March 22, 2018, 9:35 p.m.